Theatre Eddys: "Champion: An Opera in Jazz"
A lone boxer slowly and randomly punches his bag, gradually picks up steam and style with gathered strength, and finally begins to punctuate his song in staccato beats on the bag. With that singular, opening composition, Terence Blanchard introduces his and Michael Cristofer’s Champion: An Opera in Jazz -- a musical, visual, and dramatic tour de force exploring compelling themes emerging from one man’s life and speaking to our lives today. 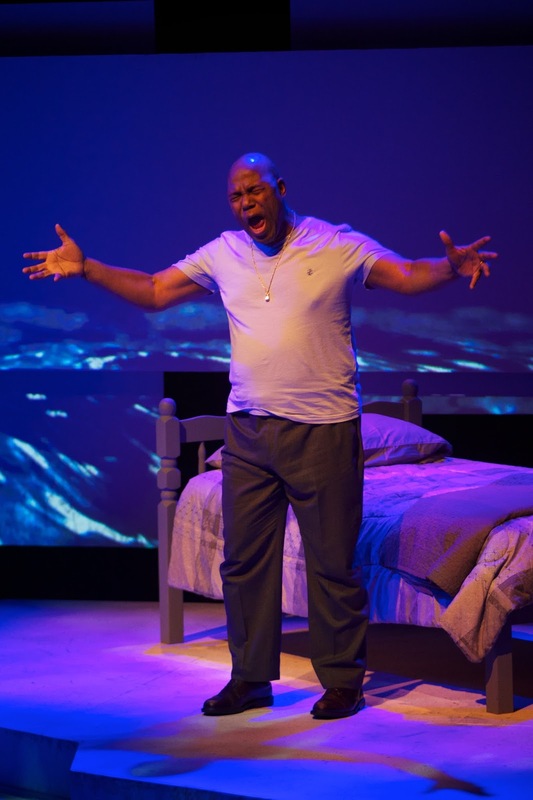 Drawing upon and intermingling the sounds of jazz, blues, soul, Caribbean, gospel, and classical, the composer provides his librettist a rich canvas to paint a story with words simple and powerful that impact at emotionally gut-wrenching levels. SFJAZZ and San Francisco’s Opera Parallèle have joined their incredible creative forces to produce the true story of a gay boxer of the 1950s and 60s who won titles and hearts around the world but who struggled with who he was as a man, what he did to another one fateful fight, and how he paid dearly in later years for the life he chose. 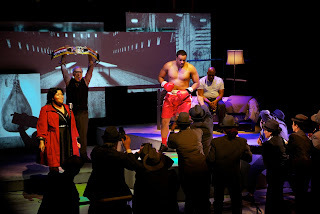 At the top of an interconnected, five-level stage surrounded on all sides by the audience, an old but still muscular man sits half dressed on his bed, looking distraught and singing in rich, haunting bass, “This is my shoe ... My shoe goes where?” Arthur Woodley is the now-aging Emile Griffith, a former welter- and middleweight boxing champion, who is slowing losing his memory of the past as well as his sense of present due to years of having his head battered in order to win matches and to entertain millions. But the past is not totally lost yet as his life and its key players populate on the stage levels below and around him for the next three hours, all the time while he sits on his bed mostly staring at the ground and occasionally interacting in song with his younger selves. Only when his son Luis (Andres Ramirez) comes in and out to urge him to dress, using tones of sweet tenor to arouse the staring Emile, does Emile occasionally leave his memory world to come to present reality. Into the older Emile’s memory cinema comes painful scenes of himself as a youngster, sent to live with his mother’s cruel cousin Blanche (Alisha Campbell). With gospel choir in the background, she beats him while with rasp, cruel voice she tells him to ‘hold these bricks above your head.” A young boy with a light, soulful soprano voice sings, “I have the devil deep inside me” as he holds two cinder blocks above his head. 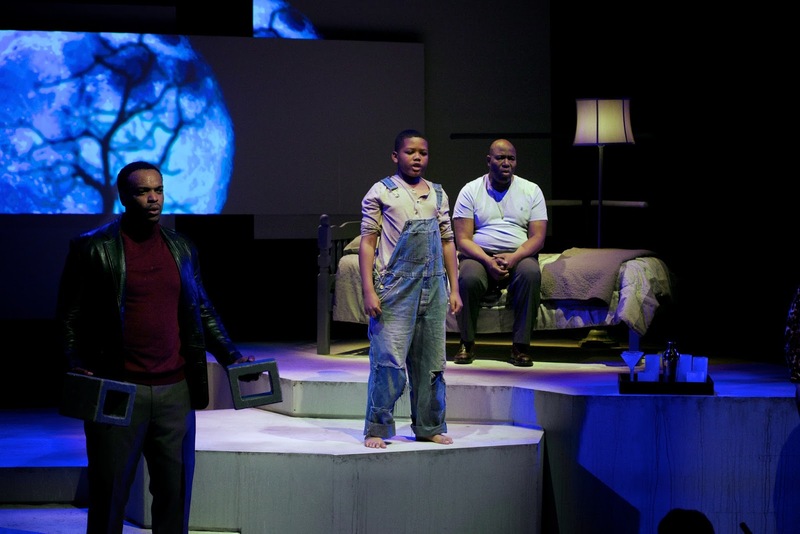 In a powerful, moving moment, all three generations of Emile sing, “Make me strong, devil ... Make me strong and get me through this night.” To all, the devil is clearly the boy’s, the man’s bisexuality. Another demon that impacts Emile’s closing decades to his dying breath is a famous title fight in 1962 with the homophobic, verbally bantering Benny Paret (Victor Ryan Robertson). Repeated blows by Emile to a head that had been abused even more in a previous fight sends Benny to his grave. As the Old Emile sings, “Something good turns into something bad so fast.” The ghost of Benny haunts his decomposing mind in sad progressions of notes and interactions between Benny’s specter and the old Emile. Perhaps the biggest applause of the evening went to the Second Act’s opening minutes. One boxer with hooded robe covering most of his head and face begins practicing his footwork. With a stage that becomes his drum, he commences a jazz solo that is packed with complicated rhythms, sudden shifts in tempo, and beats that electrify – all suddenly accompanied by his jump rope with magical powers all its own. Choreographer Joe Orrach not only has choreographed the movements and dances that illustrate the opera’s action so magnificently all evening, he solos both here and in the opening speed bag sequence with show-stopping performances. Along with all the stellar performances that bring this music and story to life, much credit for the evening’s impact must go to Director Brian Staufenbiel and his production team. Dave Dunning’s a set allows the memories and generations to flow in and out so easily from Emile’s wandering thoughts. Matthew Anataky’s lighting, built into the set itself and also falling in shadows onto the various levels of stage, highlights in remarkable ways the moods of the stories unfolding. Costumes by Christine Crook and wigs/make-up by Jeanna Parham fashion not only the key characters in clothing of the times but transform a huge chorus from islanders to reporters to gay bar queens. Media Designer David Murakami’s multi-screen projections finish the stunning effects; his use of rippled shadows across uneven surfaces is particularly effective in underlining Emile’s muddled state of mind. Finally, praise must go to Nicole Paiement as she deftly and sensitively conducts the thirty-piece orchestra while also employing a three-person jazz trio. In this compact arena of the Jazz Center with such close proximity of audience, singers, and musicians, not once do the talented musicians over-power singers nor hide their excellent diction of lyrics. Champion: An Opera in Jazz continues through February 28, 2016 at SF JAZZ Center, 201 Franklin Street, San Francisco. Tickets are available at https://www.sfjazz.org/events/2015-16/0223/champion or by calling the box office at 866-920-5299. On Free Bitcoin you can recieve free bitcoins. 8 to 22 satoshis per 5 minutes.